Set in the year 2077... a group of convicted terrorists have escaped execution by travelling back in time to 2012. Kiera Cameron, a young law official patrolling the convict’s execution, is inadvertently brought back in time with the terrorists. Finding herself alone in an unfamiliar place, Kiera realises she is the only person that stands in the way of these self-proclaimed “freedom fighters” and a potential war in the present… that wi..
Kiera Cameron (Rachel Nichols), a cop from the year 2077 finds herself trapped in present day Vancouver, searching for convicted terrorists from the future, known as Liber8. With unexpected assistance from teen tech genius Alec Sadler (Erik Knudsen), Kiera desperately tries to bring down the terrorists before they change the course of history forever. In Season 2 Kiera continues her uneasy alliance with her partner, Vancouver Police det.. 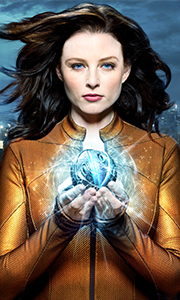 In Season 3 of Continuum, Kiera (Rachel Nichols) faces the immediate consequences of Alec’s (Erik Knudsen) betrayal at the end of Season 2 - when he disappeared in a flash of light with the time travel device Kiera hoped might send her home. Alec’s impulsive decision sets in motion a chain of events which pushes Kiera into a shocking alliance with a former enemy. Kiera must also contend with a newly strategic Liber8, and a growing darkn..
All 10 time-bending episodes from the first season. Set in the year 2077... a group of convicted terrorists have escaped execution by travelling back in time to 2012. Kiera Cameron, a young law official patrolling the convict's execution, is inadvertently brought back in time with the terrorists. Finding herself alone in an unfamiliar place, Kiera realises she is the only person that stands in the way of these self-proclaimed "freedom f..